Comments: The road make a hard left 3/4 of the way down. Heading east on 117, you'll hit Stow Center -- it's the only set of full traffic lights in town. A gas station will be on your right, the town library diagonally across the intersection on your left. Go through the lights. 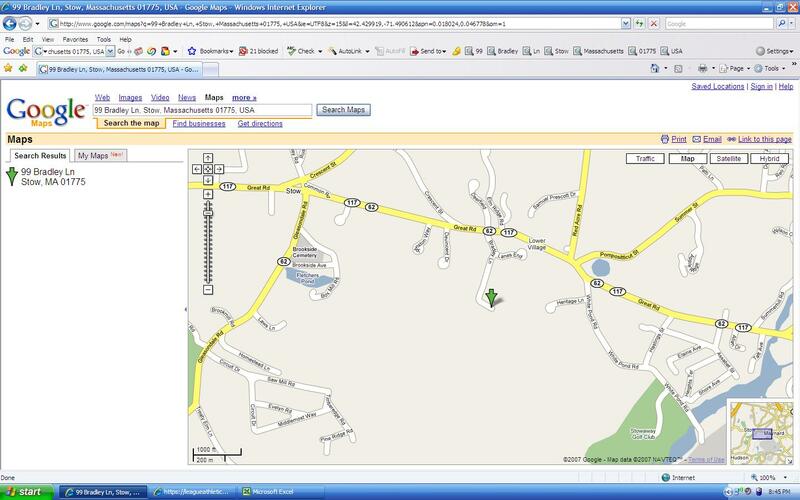 Shortly after that, keep your eyes peeled on the right for Bradley Lane. If you hit a shopping plaza on your left, you've gone too far. Follow Bradley Lane to the end. Directions: The rightmost diamond as you are walking from the parking lot toward the fields. 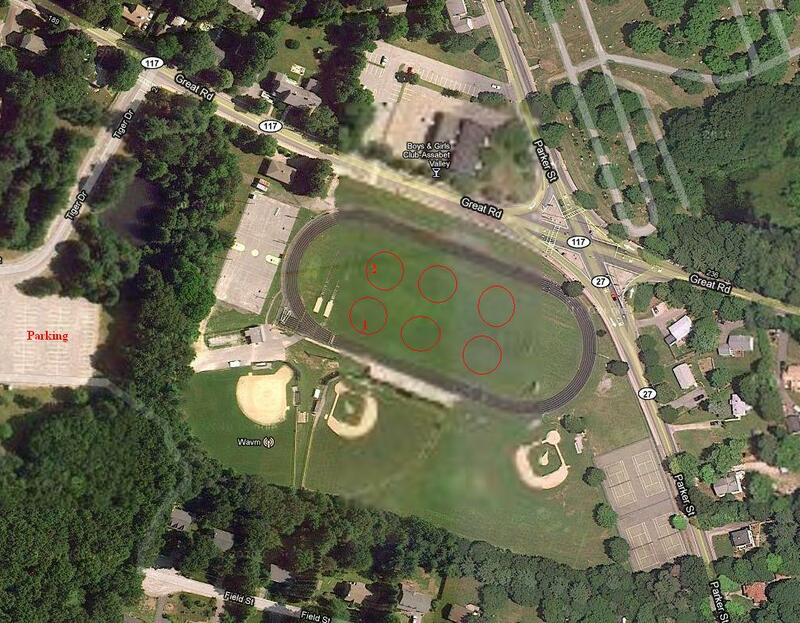 Directions: Games will be played behind the school. Tryouts will be held in the gym. Directions: Baseball tryouts will be held in the gym. Rte. 27 South from either Rte. 2 or Rte. 2A into Maynard. In Maynard Center, take a left at the traffic lights at McDonald's and straight through the next set of lights onto Waltham Street. Go 1/2 mile, past Oriental Delight Restaurant and look for the orange "MAYNARD ROD & GUN CLUB" sign on the left. This is Old Mill Road. Rte. 117 West through Weston, Lincoln, and Concord. In Sudbury, look for St. John's Lutheran Church (after Sierra's Restaurant). Bear to the right at St. John's (Rte. 117 bears to the left). Look for the orange "MAYNARD ROD & GUN CLUB" sign on the right. This is Old Mill Road. Rte. 2 West to Rte. 62 West in Concord. 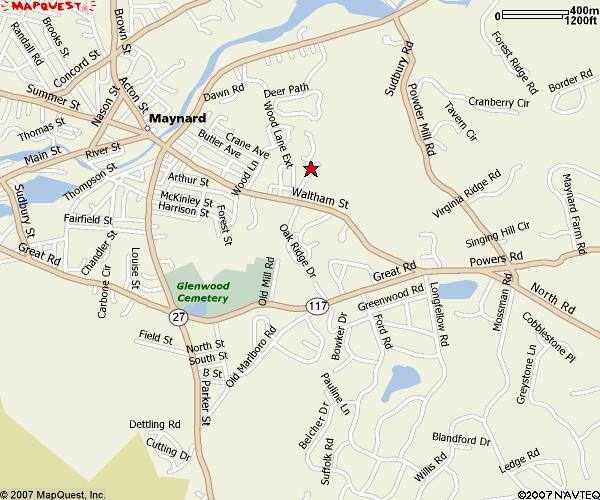 Go through West Concord and into Maynard. Take a left at the first set of traffic lights in Maynard onto Waltham Street. Go 1/2 mile past Oriental Delight Restaurant and look for the orange "MAYNARD ROD & GUN CLUB" sign on the left. This is Old Mill Road.